Don’t be fooled by the Lib Dems! 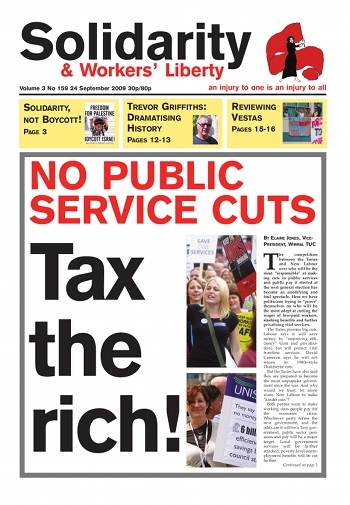 No public service cuts Tax the rich! To help the Palestinians: solidarity, not boycotts! Many socialists today consider themselves to follow the ideas of Leon Trotsky — both a leader of the Russian workers’ revolution of 1917, and the leader of the working-class resistance to the subsequent counter-revolution under Josef Stalin. Among those “Trotskyists”, the received wisdom is that in September 1939 Trotsky “defended” Stalin’s USSR in its invasion of eastern Poland. The article below, Trotsky’s response to the invasion, shows that not to be true. Barack Obama’s decision to cancel US plans to build a missile defence base in the Czech Republic and Poland has raised again the issue of America’s attitude to the Iranian regime. Part of the aim of the missile cancellation was to enlist Russia’s co-operation in stopping Iran’s nuclear programme. This pamphlet explains how Scottish nationalism came into being, how it was shaped by economic and political developments and how it has, unfortunately, shaped the workers movement. Most of the left in Scotland present a distorted view of Scottish history tailored to support arguments in favour of independence. As all the main parties agree there is no alternative to cutting back services, Janine Booth’s timely history of the struggle of Poplar’s Labour Council reminds us there is and has always been an alternative — struggle. Poplar’s revolt is generally known of on the left but speaking for myself I didn’t have had a real understanding of the significance of the struggle until reading this book. Playwright and screen-writer Trevor Griffiths uses his art to intervene politically in the events of our time. Born in Manchester in 1935 of Irish and Welsh descent, Griffiths is perhaps best-known for writing the original screenplay for Reds, Warren Beattie’s 1981 film about John Reed and the Bolshevik Revolution. The Liberal Democrats are preparing to ditch their policy of abolishing tuition fees. Nick Clegg told the first day of the Lib Dem conference in Bournemouth that, while he opposes tuition fees, it is necessary to be “realistic”. Given that both the Labour government and the Tories are committed to a deregulated system of fees in higher education, that is not claiming very much! The Confederation of British Industry, the principal organisation of bosses in the UK, has added its voice to a growing clamour for the “cap” on top-up higher education fees to be raised, saying students should view higher fees as “inevitable”. The CBI is also calling for the government to scrap its target of getting 50% of young people into higher education. On Saturday 12 September around 60 people (nearly all female) attended the student feminist group Mind The Gap’s “activist day” at London’s School of African and Oriental Studies. It was a day of contradictions. The speech given by Judith Orr of the Socialist Workers Party — attacking the “glass ceiling” — set the tone for the open debate. Israeli railway workers struck a blow against exploitation and discrimination when on 10 September a Tel Aviv Labour Court issued an interim injunction against the dismissal of Arab workers by Israel Railways.